KUCHING: A delegation from Dayak Chamber of Commerce and Industry (DCCI) comprising officials and Dayak contractors recently paid a courtesy call on Deputy Chief Minister Tan Sri Datuk Amar Dr James Jemut Masing. 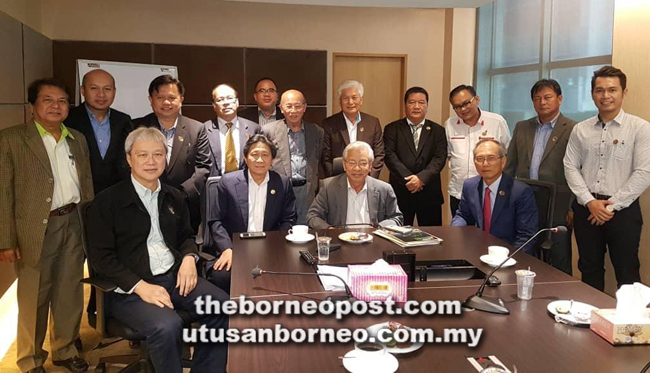 Led by DCCI president Datuk Joseph Salang Gandum, the objective of the meeting with Masing, also Minister of Infrastructure Development and Transportation, was mainly to seek an understanding of the business opportunities available in the ministry. It was also to allow the DCCI delegation to inquire as to how capable qualified Dayak companies can participate in such projects. Masing advised the contractors on the various opportunities available in the Second Trunk Road project. He said the contractors can also go for those projects announced during Chief Minister’s walkabouts, now being implemented by the Chief Minister Office. He reminded successful Dayak contractors who are awarded projects to complete the projects on time, or else they will be blacklisted and unable to participate in future government projects.